Wiring Pedestal, RM03 Grey Rayon 3 m. Choose the colour of the switch and plug. Creative-Cables is pleased to present you our new International Website. Welcome to the International Creative-Cables! 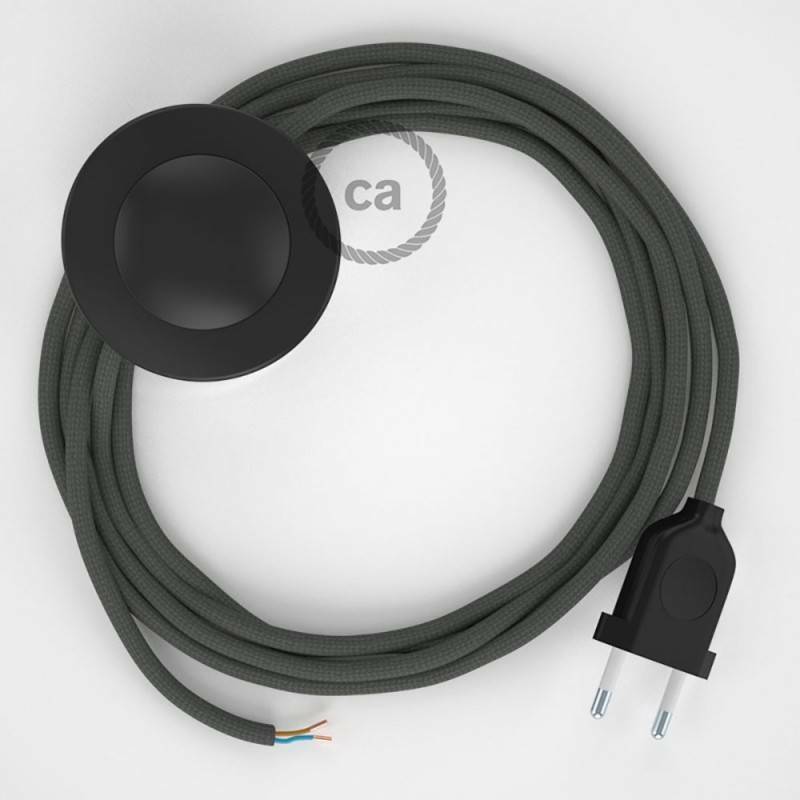 Give new colour to your floor lamp thanks to the RM03 Grey Rayon Round fabric cable, complete with switch and plug. Creative Cables' electrical wiring pedestal is done in Italy from components 100% made in Italy, to guarantee you the utmost in quality and safety. 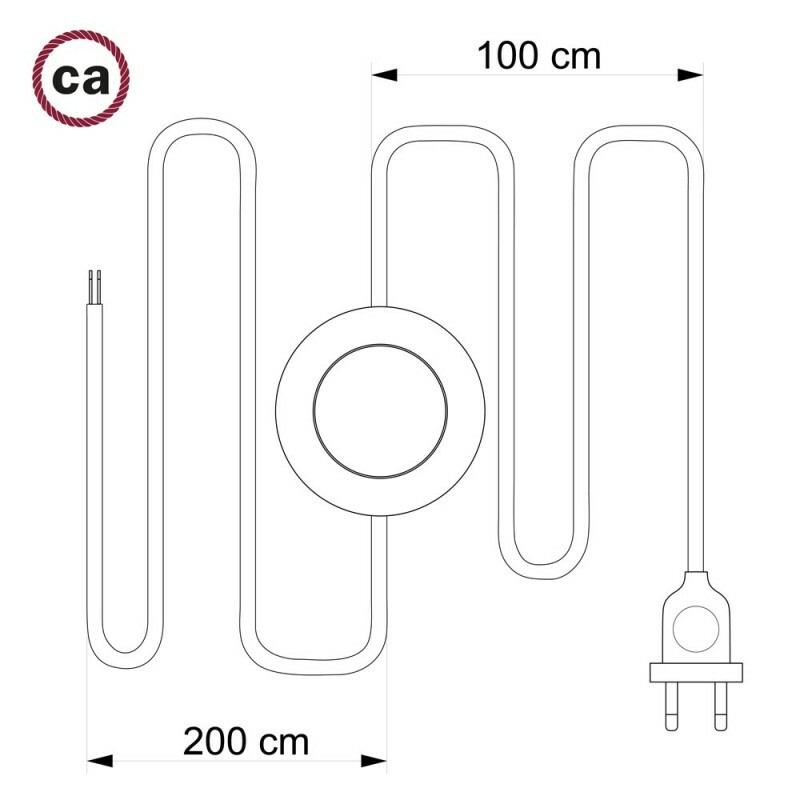 It is 300 cm long and will adapt perfectly to any kind of floor lamp. - transparent, to enhance the wiring inside. 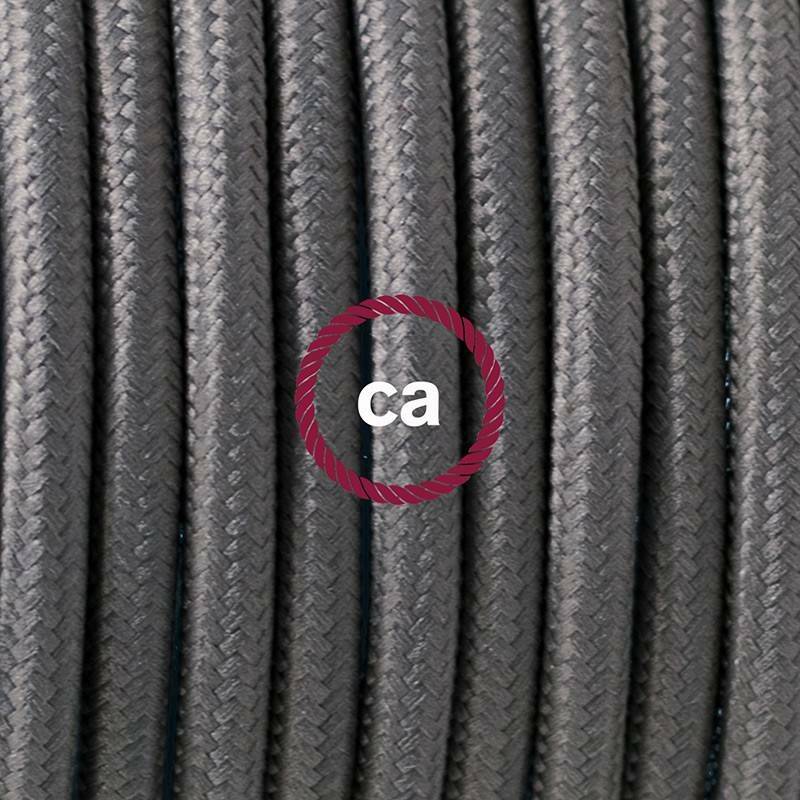 We manufacture cables of different lengths upon request. Contact us for more information and about costs. 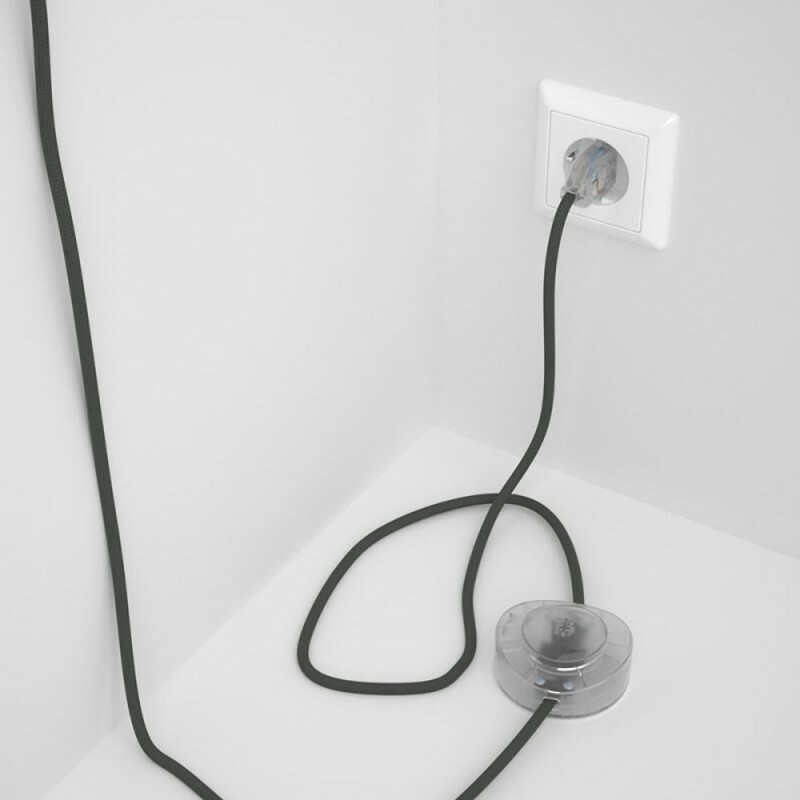 Power cord, wiring pedestal with plug and switch. Plug and switch colour: Black, White or Transparent. 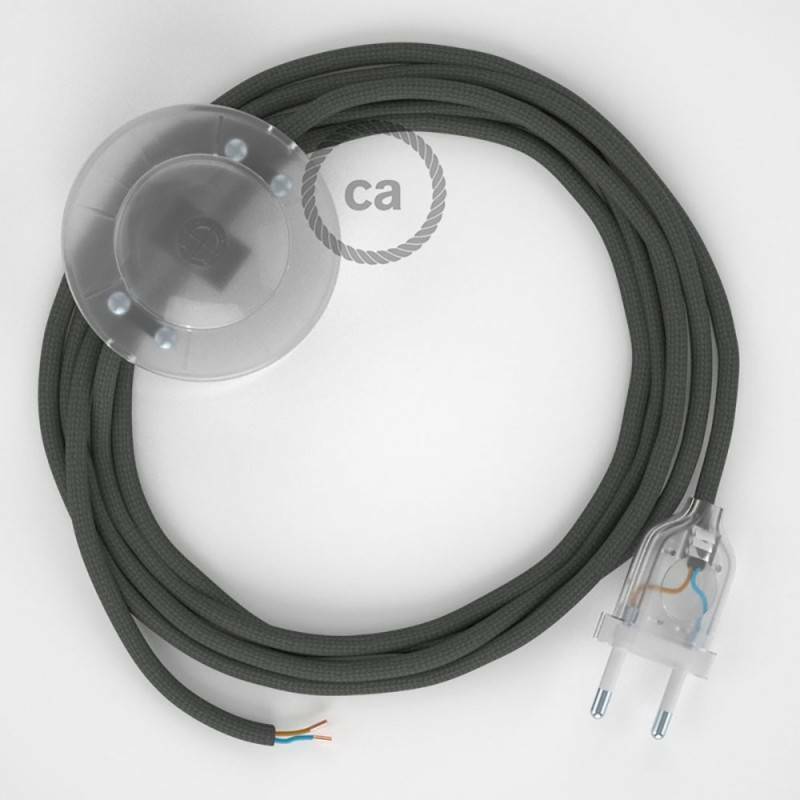 Length of cable: 3 m (100 cm from plug to switch + 200 cm from switch to end of cable) 2x0.75. Click here form more information. Wiring Pedestal, RM22 Whiskey Rayon 3 m. Choose the colour of the switch and plug. 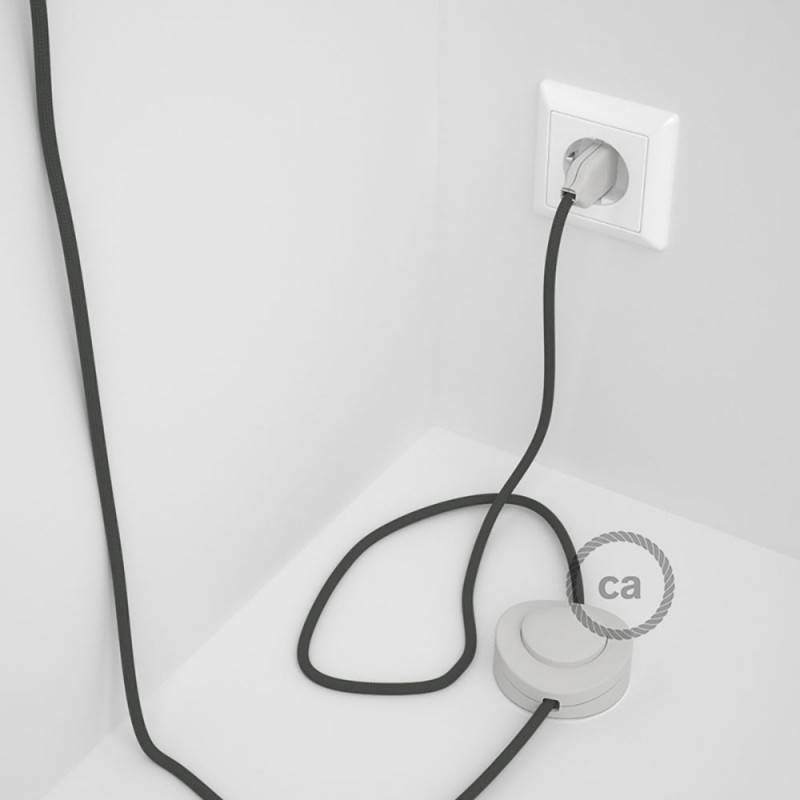 Wiring Pedestal, RN01 Neutral Natural Linen 3 m. Choose the colour of the switch and plug. Wiring Pedestal, RN02 Grey Natural Linen 3 m. Choose the colour of the switch and plug. 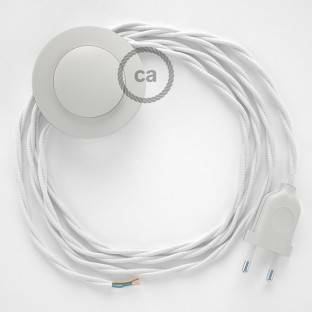 Wiring Pedestal, TM01 White Rayon 3 m. Choose the colour of the switch and plug. Wiring Pedestal, TM14 Purple Rayon 3 m. Choose the colour of the switch and plug. 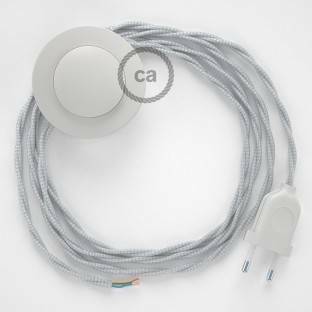 Wiring Pedestal, TM02 Silver Rayon 3 m. Choose the colour of the switch and plug. 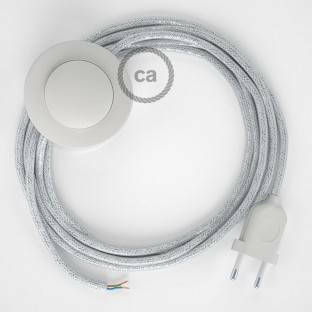 Wiring Pedestal, RL01 Sparkly White Rayon 3 m. Choose the colour of the switch and plug. Wiring Pedestal, RL02 Sparkly Silver Rayon 3 m. Choose the colour of the switch and plug. Wiring Pedestal, RL22 Sparkly Copper Rayon 3 m. Choose the colour of the switch and plug. Wiring Pedestal, RL03 Sparkly Grey Rayon 3 m. Choose the colour of the switch and plug. Wiring Pedestal, RP09 White-Red Two-Tone Rayon 3 m. Choose the colour of the switch and plug. 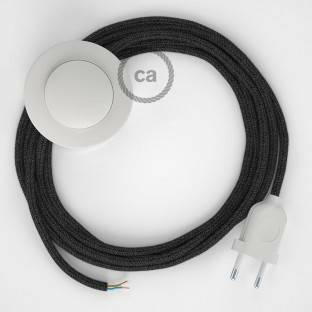 Wiring Pedestal, RP04 White-Black Two-Tone Rayon 3 m. Choose the colour of the switch and plug. Wiring Pedestal, RZ06 Green ZigZag Rayon 3 m. Choose the colour of the switch and plug. 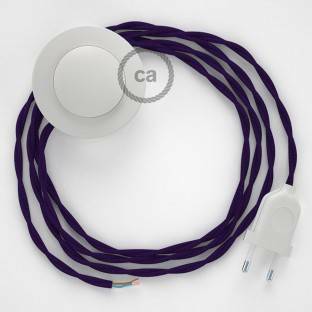 Wiring Pedestal, RZ07 Lilac ZigZag Rayon 3 m. Choose the colour of the switch and plug. Wiring Pedestal, RZ15 Orange ZigZag Rayon 3 m. Choose the colour of the switch and plug. Wiring Pedestal, RZ08 Fuchsia ZigZag Rayon 3 m. Choose the colour of the switch and plug. Wiring Pedestal, RZ09 Red ZigZag Rayon 3 m. Choose the colour of the switch and plug. Wiring Pedestal, RZ10 Yellow ZigZag Rayon 3 m. Choose the colour of the switch and plug. Wiring Pedestal, RZ11 Turquoise ZigZag Rayon 3 m. Choose the colour of the switch and plug. Wiring Pedestal, RZ12 Blue ZigZag Rayon 3 m. Choose the colour of the switch and plug. Wiring Pedestal, RZ04 Black ZigZag Rayon 3 m. Choose the colour of the switch and plug. Wiring Pedestal, RL13 Sparkly Brown Rayon 3 m. Choose the colour of the switch and plug. 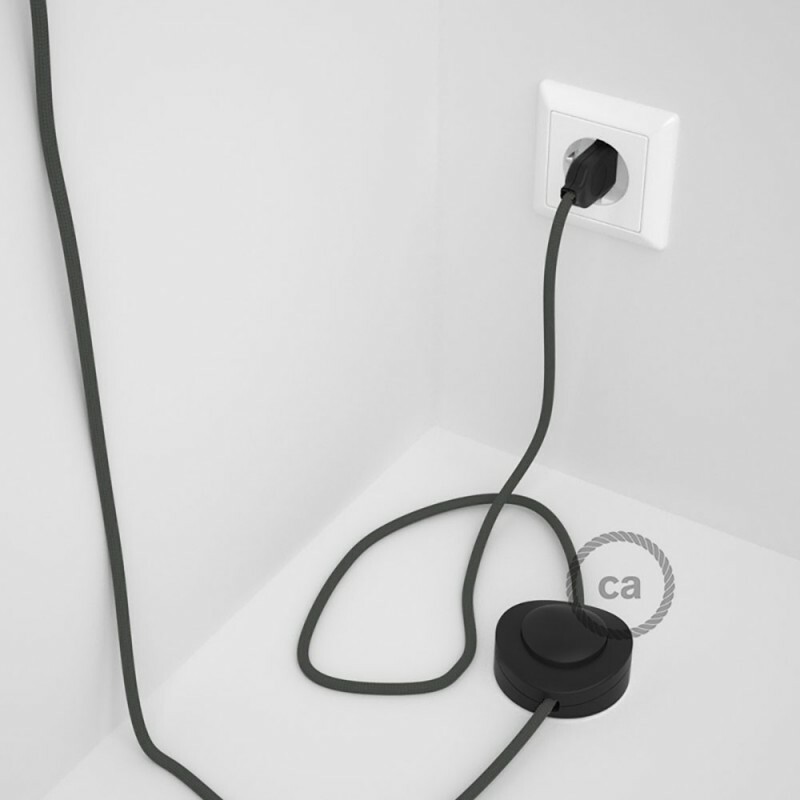 Wiring Pedestal, RN03 Anthracite Natural Linen 3 m. Choose the colour of the switch and plug. Wiring Pedestal, RN04 Brown Natural Linen 3 m. Choose the colour of the switch and plug. Wiring Pedestal, RD73 Bark ZigZag Cotton and Natural Linen 3 m. Choose the colour of the switch and plug. Wiring Pedestal, RD63 Bark Diamond Cotton and Natural Linen 3 m. Choose the colour of the switch and plug. Wiring Pedestal, RD53 Bark Stripes Cotton and Natural Linen 3 m. Choose the colour of the switch and plug. Wiring Pedestal, RD71 Ancient Pink ZigZag Cotton and Natural Linen 3 m. Choose the colour of the switch and plug. Wiring Pedestal, RD61 Ancient Pink Diamond Cotton and Natural Linen 3 m. Choose the colour of the switch and plug. Wiring Pedestal, RD51 Ancient Pink Stripes Cotton and Natural Linen 3 m. Choose the colour of the switch and plug.